Her assemblages do more than delight the eye. Consider, for example, “¡Mamí, los tíos llegan!” Yes, Auntie and Uncle are arriving, heads held high, dressed for the occasion, bringing gifts. After the first amused smile of recognition, the viewer begins to wonder: where have they come from? Aren’t they just the slightest bit uncomfortable? Have they come to stay? Uruguayan-born Sylvia Raz has a keen understanding of the dislocation of travelers. In the 60s, Raz moved from her homeland to Israel, where she worked as a nurse and teacher at a psychiatric institute. Fueled by a desire to help those with whom she felt a strong spiritual connection, our September artist developed an awareness not only of human physical expression but of human nature as well. Using bits and pieces of architectural details, discarded hat forms, odds and ends from the hardware store, color and wit, Sylvia Raz creates figures that express a tender appreciation of human foibles with joyful emotion and sensitivity. 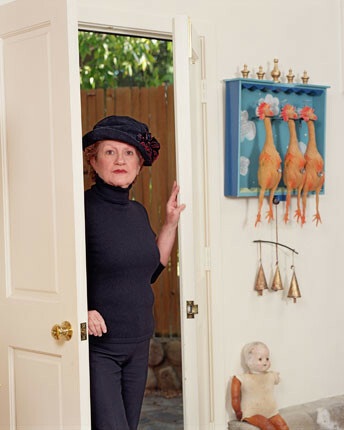 Sylvia Raz’s documentation took place in 2004 and was sponsored by Ojai Studio Artist’s. The FOTM Archive contains extensive information about this artist.